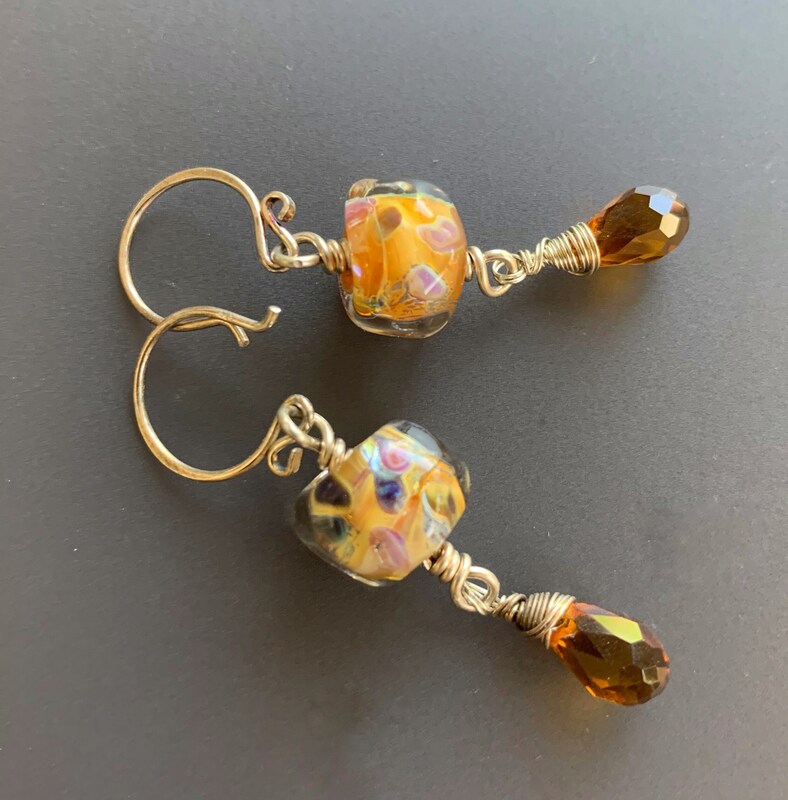 These beautiful drop earrings feature sterling silver wire, wrapped above and below two gorgeous lampworked freeform beads in multi-hued tones of rust, caramel, lavender, blue and black. I’ve suspended from these two lovely faceted teardrop root beer quartz beads and dangled them from sterling silver fancy rounded fishhook earwires. Lightweight and comfy, these earrings hang 1-3/8 inches from the earwire loop. Very nice dichroic cabs. They look great on my mosaic rocks. I love ❤️ love ❤️ love ❤️ this ring! I haven’t taken it off since I got it! My new fave. J' aime le motif ancien de la chaîne. Love the cabs, colors are beautiful! I accept both PayPal and Direct Checkout for all purchases. It is very important to me that you be happy with your purchase! An item that has not been custom sized may be returned only for a merchandise credit, and only within 10 days of receipt in its original condition and packaging. Please contact me prior to returning any packages for an authorization number. Return postage is the responsibility of the buyer; I regret I am not able to refund postage costs. I'm sadly unable to accept returns on any merchandise requiring a size adjustment. Therefore, *please* be certain of correct ring size, necklace, bracelet and anklet length before placing your order. Please note: *I do ship internationally, but will NOT ship to Italy, Spain, Mexico or most African countries due to the high number of reported thefts. * Because I try to keep my shipping costs as low as possible, packages mailed to U.S. locations are normally shipped via USPS First Class mail and international packages are shipped International First Class. The downside of shipping overseas packages this way is that there is no method of tracking or insuring the packages. PLEASE consider having your package mailed via Global Priority Mail. It costs a good deal more, but offers protection for us both. Kindly convo me for a quote to your location if you're willing to have me ship via Global Priority Mail with insurance. It is necessary to mail some of the heavier and more valuable packages via USPS Priority and Global Priority Mail. These items are so marked within the listings. In any case where you may have been inadvertently overcharged for shipping, I will cheerfully refund the overcharge to you via a PayPal refund. In order to keep shipping costs as low as possible, I do not make insurance mandatory except for items with exceptionally high value. However, I highly recommend insurance at your option. Please let me know if you'd like me to add insurance to your order. I'm also happy to ship U.S.-bound items via USPS Priority Mail at additional cost, if you're in a hurry for your item. Please, international buyers, become familiar with your local customs regulations and duties! Any duties assessed by your local Customs authorities are *your* responsibility to pay. When I fill out the required Customs form to accompany your package, I always list the actual price you paid for your merchandise. Please be aware of this and be prepared to pay additional duties if your local Customs office requires it. I am merely complying with the law. I welcome wholesale orders with proof of a brick and mortar store and accept a limited amount of custom work. Please inquire.